The Spartans managed to split their weekend series with the Golden Gophers in Minnesota, and one of MSU’s top players is getting rewarded for his efforts a few days later. 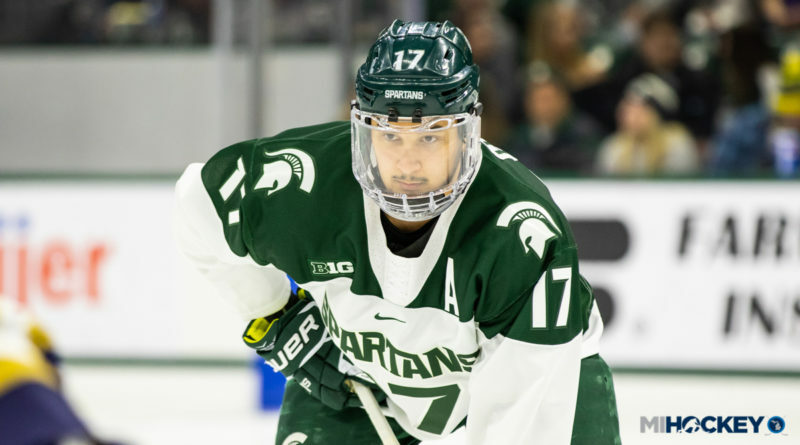 Taro Hirose has been named the Big Ten’s second star of the week, after he recorded a goal and a primary assist on the game-tying and game-winning goals in Saturday’s 4-2 win for Michigan State. He finished tied for the Big Ten lead in total points after posting four over the two games. This is Hirose’s second career weekly award and second of the season – he was named first star on Oct. 30. Holly native Jack Berry also cracked the weekly stars list, as the Wisconsin Badgers goaltender landed in the No. 3 spot. Berry backstopped the Badgers to a Friday night tie against the Wolverines at Yost (Michigan got the extra point in the shootout). He was perfect through 40 minutes of play, stopping 30 total shots. Berry registered 37 in total in the contest. He led the conference with a .974 save percentage on the weekend.